Steve Wood was one of the first cidermakers in America to reintroduce us all to a drink that we nearly forgot in the fall out that followed Prohibition: A dry, balanced wine-like beverage in which the apple shines through, and the cider is an authentic expression of the place where the apple is grown. Wood laughs about being known as "the godfather of the New American cider" (Wine Spectator said that), but it's true: If you know about American heritage orchard cider, you know about Steve Wood and his co-founder Louisa Spencer and what they started at Poverty Lane Orchards in Lebanon, New Hampshire over thirty years ago. In September, cidrbox subscribers received an assortment of the ciders that created all that fuss, powered by the alchemy of apples that made the Farnum Hill name famous: Kingston Black. Dabinett. Ellis Bitter. Golden Russet. Wickson. Médaille d'Or. And more. 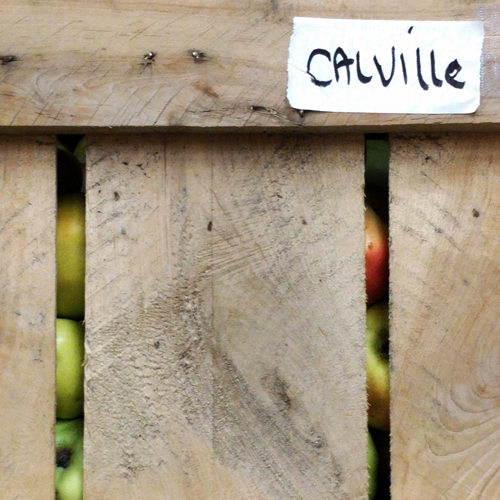 When we visited Steve and Louisa at Poverty Lane Orchards in the middle of a remarkably warm September—where the first of the Ellis Bitter harvest had just begun—we also sat down with the Farnum Hill cidermaking crew to taste the cider assortment that Steve curated for our cidrbox subscribers. At Farnum Hill the cider tasting is regular and rigorous: A small team of tasters are closely involved in the on-going evaluation of each fermentation batch, sharing notes, and directing the blending of Farnum Hill's fine orchard ciders. In the audio clip above, cidermaker Nicole Leibon and Louisa speak to the sensory analysis muscle that they and their colleagues have developed over time, and you'll experience what that muscle is like in the tasting notes that follow below. The voices that you hear belong to Steve Wood, Louisa Spencer, Nicole Leibon, Wanda Loynds, and Ryan Bishop. The team sticks closely to a descriptive analysis of the beverage in the glass, with very little hedonistic commentary on the experience or the possible causes behind the resulting beverage, while Nicole takes rigorous notes in the spiral bound Cider notebook that lives in the barn where the work is done. All of this effort is to ensure that every glass of Farnum Hill Cider that you pour meets your expectations of what that glass should hold and so that you—without bother or fuss—may simply enjoy what Steve calls: "the pure pleasure of it." Pale-gold and radically dry, Extra Dry Still displays its richness and range of fruit more vividly than Extra Dry, simply because no peppy prickly bubble sensation can intervene. Beautifully highlights the flavors of food: Try it with grilled trout or other mild fish, chicken piccata, or pork schnitzel with warm potato salad. Also pairs well with mushrooms, artichokes, Thai or Indian curries and even a simple baked potato. Farnum Hill Extra Dry does a keen, clean, fruity, aromatic number, lighting up food flavors. The light bubbles and touch of acid are a cheery greeting, and they’d be a perfect accompaniment to many appetizers and finger foods, including chunks of provolone or scoops of smelly, runny Epoisse on slices of fresh baguette; herring in cream sauce; brie and malt vinegar-pickled onions, and, more on the meal side, rich pork carnitas or smoked gouda carbonara. Farnum Hill grows their fruit across several orchards in the hills surrounding Lebanon, New Hampshire, including several ancient parcels of land outlined on Farnum Hill itself. A hiking trail runs among the orchards. Poverty Lane Orchards is open to visitors during the Fall when many folks stop by to pick their own apples from the extensive orchards. Farnum Hill 2015 Kingston Black Reserve (Still) • 750 ML • 8.5% ABV • Golden, still and dry • Special reserve, limited release • 100% Kingston Black bittersharp cider apples • Muskmelon, orange peel, bittersweet apple, candle flame on the nose • Lends savor and vividness to food—recommend pairing with subtle dishes • Made from the temperamental Kingston Black apple, long treasured in the UK, as a single-variety cider fruit for its rare balance of tannin, sugar, and acid. In old apple variety names, black describes an apple that is extremely dark red. Farnum Hill’s Kingston Black Reserve pairs well with fatty cured meats, such as sopressata, prosciutto, or spicy capicola; with fatty fish such as roast salmon in this mustard-y preparation, or a rich Toulouse-style cassoulet, followed by a gullet-clearing handful of green grapes or a ripe fig. The sparkling Semi-Dry Pairs well with seafood, cheeses, ham, egg-based dishes, crepes—even desserts like fruit tarts and custards • Bracing enough to accompany grilled rib-eye steaks, pre-salted and peppered, warmed to room temperature, and flash-grilled to a delightful medium rare, or accompanying a hearty choucroute garnie. Farnum Hill waits for the cider fruit to full ripen and drop before harvest to ensure that the fruit is used at its peak. Our great thanks to food and wine writer Peggy Haine for providing our Farnum Hill cider pairings. Cidrbox.com connects people seeking orchard-driven cider with cidermakers who are a credit to their craft. 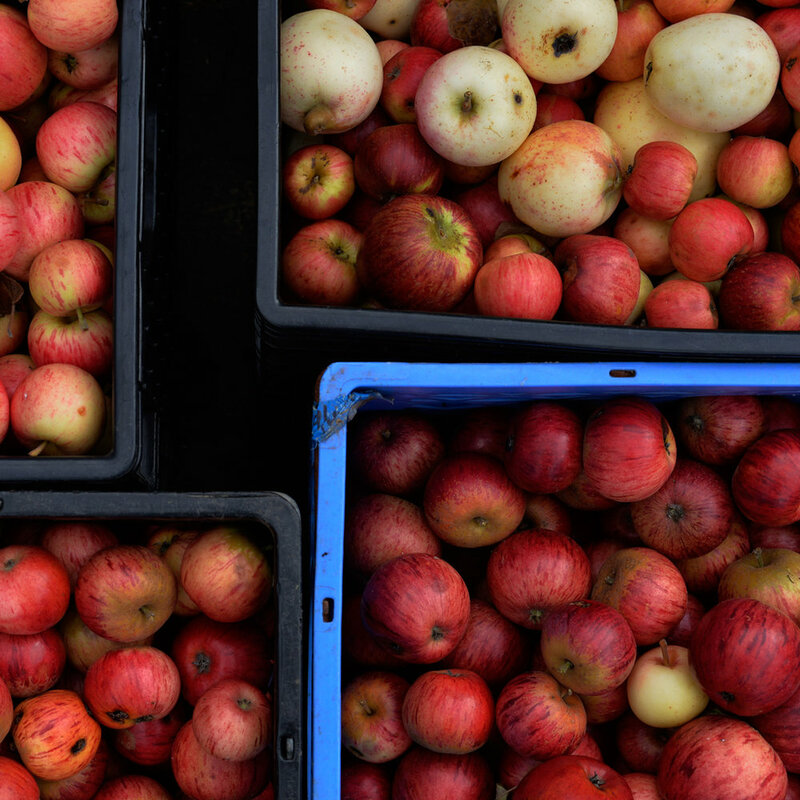 Each month we visit a single, distinctive American heritage orchard — where small producers grow their own apples and fresh press and ferment their cider like fine wine — and we ship their cider direct to our subscribers. We also sit down for a cidertasting with the maker, which we share with you here at cidersessions.com. Join us in October when we will feature Dragon's Head Cider from the Pacific Northwest. For Kite & String Cider it starts with the soil: A rich, resilient stew that organic farmers Melissa Madden and Garrett Miller cultivate through careful attention and the right application of grazers and growing things on the Good Life organic farm in Interlaken, New York. Brother cidermakers Garrett and Jimmy Miller create their cider from a healthy harvest of New York-grown European bittersweets and sharps, as well as bright, acidic American heirloom fruit, grown in this living soil. It’s no coincidence that several of their ciders borrow their name from the earth itself, and the beverage in the glass evokes strong presence of place with aromas of damp earth and dark fruit. Kite & String is a rebranding of the Good Life Cider label that won high praise from Mark Squires in Robert Parker's Wine Advocate, where he describes their cider as: Pretty terrific. Clean, fresh and very dry, it has fine purity of fruit, an elegant demeanor and some controlled tension on the flavorful finish. Same cidermakers, same orchard, new name. a good goes-with-nearly-anything cider to have on hand. We like it with a smooth Havarti cheese or salty Manchego, but also see it accompanying poultry, roast pork, choucroute garnie, or Piggery cranberry-sage sausage with a side of homemade sauerkraut. It’s a match with nearly anything porky, but can also balance out a serving of spicy blackbean cakes. Kite & String Funkhouse 2016 • 750 ML • 7.8% ABV • 0% RS • Bone dry, lightly sparkling • Limited run: Only 97 cases produced • Bottle conditioned and aged sur lie • Blend of American heirloom, crab, and English bittersweet apples, including • Ben Davis/Funkhouse, Yarlington Mill, Dabinett and Pioneer Crab • Smooth, astringent mouthfeel with modest acidity • Take the Funkhouse South with fried chicken or catfish and collard greeens cooked with ham hocks, and a side of cornbread made with fresh corn kernels and minced jalapeños. Kite & String Organic Brut 2015 • 750 ML • 8.7% ABV • Dry, organic, and bottle-conditioned • Limited run: Only 80 cases produced • Blended from 100% organic American heirloom sharps including Goldrush, Liberty, Melrose and Hemlock Grove • Traditional champagne method • Aged on secondary lees for 10 months • The Champagne of ciders, the Brut is dry and complex. Pale in the glass, it unleashes a blast of eye-lash-tickling bubbles, along with a perfume-y floral nose. And aged 11 months on the lees (that’s exhausted yeast, which gives it a pleasant bready flavor) it’s the closest thing to Champagne that an apple can produce. We urge you to rustle up some proper blini for this lovely bubbly. Fresh out of caviar? Then go for wild-mushroom ragout on toast, or fresh fig halves with gorgonzola. Kite & String Northern Spy 2016 • 750 ML • 8% ABV • 1.9% Residual Sugar (RS) • Semi-dry single varietal • 100% American heirloom Northern Spy • Blended from four independent fermentations to maximize varietal expression and character • Lively effervescence produced through charmat method secondary fermentation • We loved the sweet/tart balance of fizzy, charmat-method Northern Spy with a shrimp-and-salmon bisque, but could pair it with a variety of creamy main courses: Mac and cheese with three or four good cheeses would do; Appetizers: Crab cakes with chutney or garlicky rustic paté on sturdy peasant bread; Even dessert: Apple pie with walnuts (substitute cardamom for cinnamon) and a slice of aged cheddar, ricotta cheesecake with raspberries, or a not-overly-sweet crème brulée. Kite & String Rosé 2016 • 750 ML • 8.2% ABV • Naturally sparkling via Method Charmat • Bright acidity • Classic sharps — Baldwin, McIntosh, Goldrush, and Newtown Pippin — blended with Maréchal Foch red wine and unfermented Riesling juice • Strawberries and mixed berry fruit on the palate • The assertive note of honey in the Rosé plays well with the spicy complexity of Asian foods: Suggested pairings are coriander-dusted ribs, grilled shrimp with pickled lime, or a Sichuan-style whole sweet-and-sour crispy fish with a side of white rice. On the milder side, try a slow-baked side of sockeye salmon with an avocado-lemon sauce. Or set out a bowl of summer strawberries and simply enjoy this delightful rosé chilled, along with the summer sunset. Good Life Barrel Rye 2015 • 750 ML • 8.2% ABV • 1.2% RS • Winner Good Food Award 2017 Award • Off-dry, naturally sparkling from traditional method fermentation • Featuring Golden Russets and a blend of English bittersweets including Yarlington Mill, Dabinett, Tremlett’s Bitter • Aged in American oak • Oak, smoke and shalestone on the nose • Buttercream with a backbone • We suggest pairing the Barrel Rye with brunch: A creamy quiche with lots of bacon and Emmenthaler, pork rillettes on toasted crostini, or an omelet enclosing last night’s chopped vegetable leftovers. Garrett and Melissa are also founders of the Finger Lakes Cider House which features the cider of other extraordinary producers in the region and has become a destination for cider lovers. Our great thanks to food and wine writer Peggy Haine for providing our Kite & String cider pairings. Cidrbox.com connects people seeking orchard-driven cider with the artisans who make it. Each month we visit a single, distinctive American heritage orchard — where small producers grow their own apples and fresh press and ferment their cider like fine wine — and we ship their cider direct to our subscribers. We also sit down for a cidertasting with the maker, which we share with you here at cidersessions.com. We will be shipping Kite & String Cider from the Finger Lakes throughout July. Join us in August when we're featuring Prima Cider from the Great Lakes. At around the 2:40 minute mark in the Pirate's Plank tasting notes below you'll hear Bear Bishop (his folks named him Steve) talk about applying flame to his orchard and inflicting terror on his trees. He is not speaking in metaphors. Bear is a former Hotshot fire fighter for the National Park Service, and one of the tools that he deploys in the Alpenfire orchard—the first orchard ever certified organic in Washington State—is fire. The cider and heirloom apple trees that Bear planted with his wife and colleague Nancy all wear silver skirts to protect their trunks from the blow torch that he periodically strokes across the orchard floor, to simulate the fiery lick of a controlled burn. When I visited in March the soil of the orchard was a springy, soggy sponge still waterlogged with the rains of winter, and the counterpoint of flame, in this damp corner of the Pacific Northwest, made perfect, elemental sense. Wet and cold: Meet dry heat. Dark cloudy day: Meet firelight. Fire fighting was a family affair—both Bear and his son Philipe worked the fire line—and now cidermaking is too. The Bishops—Steve, Nancy and Philipe—grow, press, ferment and market a spectacular line of organic orchard cider conceived from over twelve varieties of cider and heirloom apples that they grow along trellises in a bowl carved within the Olympic rainforest, ringed by majestic Douglas Fir. As Washington state natives who grew up a short ferry ride away from the Canadian border, the Bishops were introduced to cider by their neighbors to the North. In 2001 they toured the cider countries of Europe to learn more about traditional production methods and discovered that many cideries were producing on a small scale, driven by family orchards. This was perfectly suited to what they had in mind. And they learned something else, equally important: That true cider apples were key to producing the cider they loved to drink. A hard cider rich in tannins, lively acids, and aromatics that, when properly fermented, allowed the flavor of the fruit to shine through. After studying with renowned UK cider producer and educator Peter Mitchell, Nancy and Bear invested in 900 French and English cider apple trees and laid down their first orchard acreage near the town of Port Townsend, just opposite Seattle on the other side of the Puget Sound. The Bishops committed to organic orcharding practices at the outset, and in 2007 Alpenfire became the first certified organic cidery in the Pacific Northwest. Today the cider varieties that the Bishops planted in the early 2000s continue to thrive in the low nitrogen, bare bones soil of the Olympic Peninsula where they grow their Dabinett, Foxwhelp, Yarlington Mill, Kingston Black, Brown Snout, Vilberie, Muscadet de Dieppe and other heirloom apples. In recent years they have also laid in early American Varieties and five types of Perry Pear trees. From this fruit has emerged a line of cider varieties named after the wildfires that Bear and his son Philipe once battled as Wildland fire fighters across the US, and which gave birth to the cidery’s name: Alpenfire. Alpenfire's Glow received Best of Show and the Chairman's Award at Dan Berger’s International Wine Competition in 2016. Ember Bittersweet received a GLINTCAP Bronze for French Style Cider in 2014 and the Spark! Semi-sweet received a Silver from Sip Northwest Best of the Northwest for Traditional Apple Cider in 2016. I hope you enjoy our cider tasting as much as we did—they're available on this page, wherever you see the Soundcloud "play" button, and they're also available in their entirety on Soundcloud. You will need either the Soundcloud app for Android or iOS or Adobe Flash installed on your smartphone or web browser. The voices you hear are cidermakers and orchardists Nancy, Bear and Philipe Bishop. Pair Alpenfire Spark! with Steamers with Linguini. Trust me. Diane Flynt planted her American heritage apple orchard in 1997 with an eye to producing fine cider with the same careful attention to slow fermentation and artful blending that a winemaker attends to when making wine. We don’t want a place to hide in our beverages. I don’t want to hide the flavor of my apples behind anything. So we don’t use oak, we don’t add flavoring, we don’t add hops or assertive yeasts. I want the fruit to speak for itself. Forbes Magazine called Windfall Orchard cider the spectacular hard cider you’ve never heard of because it's nearly impossible to get your hands on this cider outside of Vermont or Massachusetts. In January we shipped two hard cider varieties from Windfall Orchard: Windfall Orchard Ice Cider shipped to all CIDRBOX subscribers, and the native yeast fermented Windfall Orchard Farmhouse Hard Cider shipped to all 6-bottle and 12-bottle CIDRBOX subscribers. We were also able share with our subscribers a limited run of Windfall Orchard Farmhouse Perry available by special order. After we shipped the box, I joined Brad for a lunch of sublime leftovers at his home in Cornwall, Vermont, to learn more about his cider and his philosophy of cidermaking. While the chicken and fennel warmed on the stove, we spooned Jasper Hill Farm Winnimere cheese onto fresh, crunchy bread, and nodded approval at how well it paired with the first glass of perry that Brad poured into champagne flutes ("it's better for the bubbles," he said). The word windfall means a piece of unexpected good fortune, but that good fortune began in the orchard – the word originally meant an apple blown down from a tree by the wind. Windfall Orchard received its name from the country doctor, Ted Collier, who pulled it from a poem by his neighbor, the poet Robert Frost, who taught just down the road from here at the Bread Loaf School of English. Collier acquired the orchard when it was just a strip of Rhode Island Greenings planted in 1918. 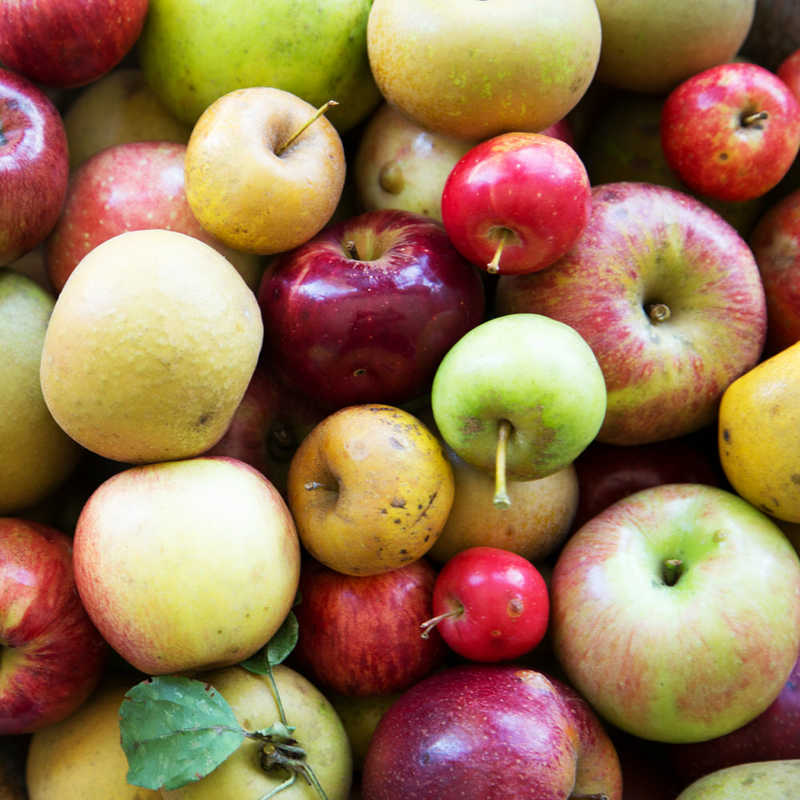 In the 1950s, Collier and his friend and orchardist Art Blaise grew the acreage to over 50 varieties of heirloom apples including Northern Spy, McIntosh, Cortland, Roxbury Russet, Esopus Spitzenburg, Winter Banana and the Westfield Seek-No-Further. Our lunch of orange braised chicken and fennel adapted from Yotam Ottolengthi's Jerusalem cookbook (also available from Amazon) paired beautifully with both the Windfall Orchard hard cider and the perry. Since acquiring the orchard in 2002, orchardist Brad Koehler has expanded the apple varieties to over eighty, through the careful grafting old McIntosh or Red Delicious trees with heirloom, cider and dessert apple varieties. Koehler’s Farmhouse Hard Cider contains over twenty of these apple varieties; Windfall Orchard Ice Cider contains over thirty. Windfall Ice Cider also includes old chance seedling varieties that only exist at Windfall Orchard, and are picked by hand when perfectly ripe to ensure that the fruits’ peak aromatics and flavor carry through to the finished ice cider. All of the apples in Windfall Orchard ciders are sourced from their Cornwall orchard or immediate area, providing you with a true taste of regional terroir. If cheese for dessert isn't your thing, Brad suggested that an apple cake with bourbon would pair well with his Windfall Orchard Ice Cider—and we suspect that this apple and olive oil cake with maple frosting would also be pretty spectacular. Brad Koehler, Orchardist and Cidermaker at Windfall Orchard, grows over fifty varieties of apples in his Cornwall, Vermont heritage orchard. The Koehlers will be opening a tasting room at Windfall Orchard in the Spring of 2017. Pair eggs benedict with Windfall Orchard Farmhouse Perry the next time you kick back over a long weekend breakfast. In January we included an encore round of Eden Specialty Ciders in the CIDRBOX: The three bottle assortment contained the Eden Semi-Dry, which subscribers have not yet experienced, and Guinevere’s Pearls, which six and twelve bottle subscribers received in the December box. Eden Sparkling Semi-Dry is a main course cider: Pair it up with mustard braised chicken or a rich quail dish. You can also warm up the palate (or round out the meal) by sharing a ripe aged cheddar or a grassy goat cheese like Lake's Edge, produced by Blue Ledge Farm in Vermont, and named one of the Best 100 Cheeses of the World by Wine Spectator Magazine. We were excited to bring the hard-to-find Windfall Orchard to our subscribers in January, along with other stunning Eden ciders. We will be announcing our next small maker boxes soon—thanks again and stay tuned. Cidrbox.com connects people seeking orchard-driven cider with the artisans who make it. Each month we visit a single, distinctive American heritage orchard — where small producers grow, harvest, press, ferment and refine their cider — and we share their cider with our subscribers. In December we traveled to Newport, Vermont to ship our first CIDRBOX and sit down with Eden Specialty Ciders at the Northeast Kingdom Tasting Center and taste their American heritage fine cider. We've shared that cider session—with its tasting notes, recommended pairings and conversation with cidermakers David Biun and Eleanor Léger and cider tasters Briana and Andrea—here for you. All of the ciders featured in this tasting shipped in the December 2016 CIDRBOX, curated by Eden Specialty Ciders. Eden ciders originate in the crisp climate of the American Northeast along the 45th parallel, where the juice of their New England and Old-World apple varieties is naturally cold concentrated outdoors in the long Vermont winter prior to fermentation. Given the latitude, it’s no surprise that Eden first gained critical attention for their award-winning ice cider, produced from New England and Old World heirloom apple varieties. In recent years the Eden team has applied the same cidermaking philosophy to create award-winning traditional ciders from the same regional orchards. Eden ciders have won Best in Show/Class at the Great Lakes International Cider Competition in each of the past 5 years. Most recently their Sparkling Dry Cider won GLINTCAP Best in Class: New World Heritage in 2016. 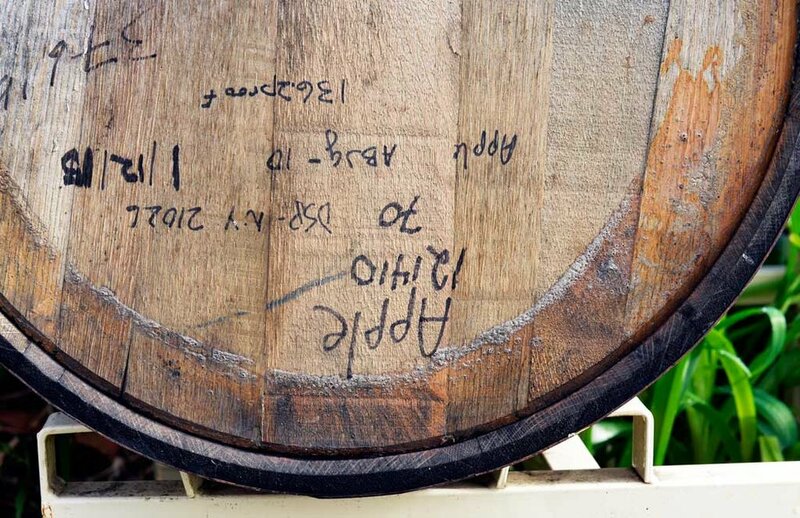 Eden was also awarded the Good Food Gold in both 2016 and 2015 for their Heirloom, Brandy Barrel Heirloom, and their Sparkling Semi-Dry ciders. Eden is also the only cidery in the US to be awarded the Slow Food Snail of Approval for being good, clean and fair. Pair Eden Sparkling Dry Cider with Pork Roast with Apples and Onions—or, if you're lucky enough to live where oysters are fresh and plentiful, try it with several on the half-shell, unadorned. Eden sources their apples from their own Eden Orchards, where they grow thirty-five varieties of apples holistically, as well as from six other notable regional orchards. Among them: Scott Farm of Dummerston, VT, Heath Orchards of Stanstead, QC, and Poverty Lane Orchards of Lebanon, New Hampshire. Pair Eden Cider Cellar Series #5: Juliette with anything you might serve with a white wine—like a simply prepared salmon. For dessert? Pair it up with a simple shortbread cookie. For something surprising? Pair Eden Heirloom Blend Ice Cider with Fois Gras during the meal. For all its sophistication, Eden Cellar Series #4: Guinevere's Pearls makes a killer pizza cider. This cider was born to pair with cheese and smoked meats—which makes it a perfect fit with a cheese and charcuterie plate, too. Try the Eden Imperial 11° Rose Cider with a really good burger, or pair it up with the salty tuna of a classic Salade Niçoise. Maple crème brule. Salty caramels. A pear tart on a walnut shortbread crust. Or a stunning blue cheese. Any of these, paired with Eden Brandy Barrel Aged Heirloom Blend Ice Cider, will beautifully finish your meal.